This is the first step in the Enlightenment series … see also “Enlightenment II” … LInk: “Enlightenment II: Raising the Kundalini to Heal the Human EMF and Alleviate Ascension Symptoms,” by Alice B. Clagett, written in April 2014 … https://wp.me/p2Rkym-5yX ..
I’ve blogged some on the fight or flight response we humans are experiencing as a result of the DNA changes occurring during Solar Events … essentially due to the ramping up of the Incoming Light because of our Solar System’s entry into the Photon Belt (greater Light) of the Pleiades in 2012. At any rate, the long and the short of it is, the body cells are very, very conservative. Any little prospect of change throws them into a tizzy. Being flooded with ramped up photonic Light during a Solar Event is one such stimulus, and one humankind is beginning to be aware of due to the fact that everyone is, slowly but surely, becoming clair EMF-sensitive. When I read about this, I was immediately taken back to my youth, out in the countryside, where I saw our family German Shepherd enthusiastically digging up a rabbit burrow, and uncovering a little rabbit inside the burrow. Clearly the rabbit was frozen with fear … It ‘shrank into itself’ … With great concern, I picked it up. It was as if paralyzed, unseeing, unfeeling, completely unresponsive. Sometimes they would come back to awareness and bite me (the ‘fight’ response). And sometimes they would simply die in my hand. I guess their hearts just stopped beating out of fear. As the Light of Summer Solstice floods into the planet, often without our conscious awareness, our bodies will go into fight-or-flight or freeze-and-dissociate mode. One of our subtle bodies is the Body of Light. Saturation of this subtle body with the Incoming Light is all for the good, as the amped up light instructs our DNA on how to unfold from the 2-strand shut-down mode that keeps our physical bodies functional during the Great Ages of Darkness (10,500 very long years) (2) to the 12-strand potential we all enjoy during the 2,000-year (all too short) Ages of Light. About the Sushumna. The Sushumna is the central channel through which the kundalini energy is able to arise after the energies of the ida and the pingala are evenly balanced. The kundalini energy is awakened through mastery of the yogic ‘locks’ … such as ‘root lock’ (4). The Unconscious Mind, also known as the Lower Mental Body, is associated with the Autonomic Nervous system (the ANS) (7). The ANS consists of the Sympathetic Nervous System and the Parasympathetic Nervous System. The action of the Sympathetic and Parasympathetic nervous systems is ‘opposite’ or ‘antagonistic’. That is, they have opposing effects. The Sympathetic Nervous System … ‘fight-or-flight’ functions of the Unconscious Mind … is associated with the Ida. Our human breath naturally alternates between the left and right nostril during the day. Some report the interval for each energy as 20 minutes, and others, as much as 2 1/2 hours. This switching of the breath from left-nostril breathing to right-nostril breathing has been posited to account for unconscious alternating of sleeping position from lying on the left side to lying on the right side at night. The Ida is associated with breathing through the left nostril; the Pingala is associated with breathing through the right nostril. Putting it all together, we can consciously change the operation of the Autonomic Nervous System … and the Unconscious Mind … by practicing left-nostril or right-nostril breathing. While first learning left-nostril breathing, use the thumb of the right hand to close off the right nostril. Mouth is also closed. This forces the breath through the left nostril. The other fingers of the right hand are pointed up, like antennae. In time, it will be possible to switch to left-nostril breathing by simply placing the awareness on the left nostril, and feeling the breath there … the hand pose will no longer be needed. Long Deep Breathing Also Inhibits the Fight-or-Flight Response. As an alternative, the fight-or-flight response can be suppressed through the yogic technique known as Long Deep Breathing. For details, see (5). While first learning right-nostril breathing, use the thumb of the left hand to close off the left nostril. Mouth is also closed. This forces the breath through the right nostril. The other fingers of the left hand are pointed up, like antennae. In time, it will be possible to switch to right-nostril breathing by simply placing the awareness on the right nostril, and feeling the breath there … the hand pose will no longer be needed. 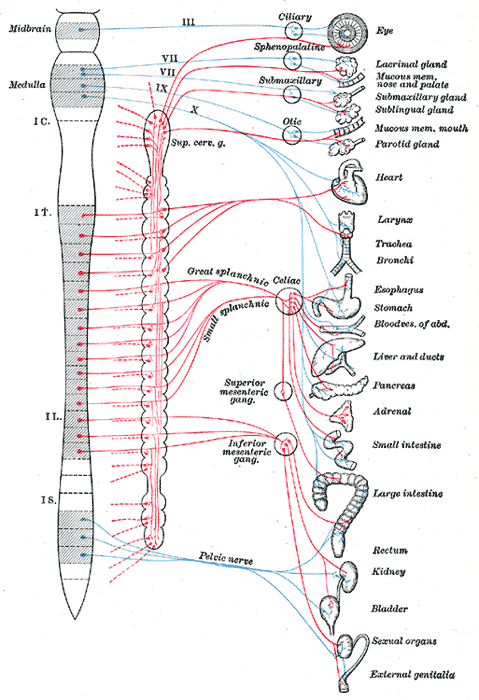 Just as the Autonomic Nervous System is associated with what is known in Theosophy as the Lower Mental Body, the Somatic Nervous System is associated with the Higher Mental Body. Alternate Nostril Breathing Links the Autonomic Nervous System to the Somatic Nervous System, and the Lower Mental Body to the Higher Mental Body. Alternate Nostril Breathing, as described in reference (5), is a yogic technique that brings the Ida and the Pingala under conscious control. In other words, the Autonomic Nervous System is linked or hooked to the Somatic Nervous System. Thus it brings the Lower Mental Body, as described by the Theosophists, into the awareness arena of the Higher Mental Body; and these two subtle bodies achieve Unity. First, use the right hand to block off the right nostril. Fingers of the right hand are held up, like antennae. (See the image ‘Alternate Nostril Breathing: Step 1″ below.) Inhale long and deep through the left nostril. 2. Next, release the block on the left nostril, Use the ring finger or index finger of the right hand to block the left nostril. (See the image ‘Alternate Nostril Breathing: Step 2″ below.) Exhale long and deep through the right nostril. 3. Keeping the same finger and hand position, inhale long and deep through the right nostril. 4. Then switch back to the finger position shown in step 1, and exhale long and deep through the left nostril. Begin again at Step 1, and continue with this alternate nostril breath for 3 to 11 minutes, but stop at any time if you begin to feel uncomfortable. There is a good description of Alternate Nostril Breathing for Balance here: (9). Note that the hand position used to block off the left nostril during alternate nostril breathing is different from that described above for right-nostril breathing (above in this blog). This is because the finger position in the alternate breathing technique is modified to be accomplished using just the right hand. Even Nostril Breathing Unites the Brain Hemispheres. Even Nostril Breathing is a state where the breath flows evenly through both nostrils, uniting the Ida and Pingala, and the right and left hemispheres of the brain. The result is Cosmic or Universal Mind. Alternate Nostril Breathing (described above). This is a good practice just before arising in the morning, during meditations, and just before falling asleep, I feel. Soham Mantra: Imagine the sound Sooooooo when inhaling, and the sound Hummmmmm when exhaling. This mantra can be practiced all day long. By practicing these breathing techniques, one can unite the unconscious mind with the conscious mind, and also unite the hemispheres of the brain. The result is a state of mental Unity that lays the foundation for the mystical experience known as Enlightenment. (1) See … Link: “Trauma and the Freeze Response: Good, Bad, or Both? Have You Ever Been So Dissociated from Fear that You Simply Dissociated from It All?” by Leon F. Seltzer, Ph.D., 15 July 2015, https://www.psychologytoday.com/blog/evolution-the-self/201507/trauma-and-the-freeze-response-good-bad-or-both ..
(2) Link: “The Photon Belt: The Coming of a New Age,” from BurlingtonNews … http://www.bibliotecapleyades.net/universo/esp_cinturon_fotones_6.htm ..
(3) The ajna, or third eyepoint, is associated to the pineal gland in the center of the head at the level of the eyebrows. The pineal gland is connected with the pituitary gland, located slightly lower and a little more toward the front of the head, via a ‘golden cord’ of energy. For more on this, search cord at Link: “Awakening the Soul,” by Yogi Bhajan (Siri Singh Sahib Bhai Sahib Harbhajan Singh Khalsa Yogi Ji) … http://fateh.sikhnet.com/sikhnet/articles.nsf/9dee2aa6164e1d9b87256671004e06c7/e4ae53a709997198872576fd007d1747!OpenDocument ..
See this image of a man’s head, showing the Ajna Chakra, the pineal gland, and the pituitary gland … https://iamofthestars.files.wordpress.com/2016/06/94d0a-pinealgland.jpg ..
(4) See Mulabhanda in Kundalini Yoga: Bhandas or Locks … http://www.kundaliniyoga.org/bhandas.html ..
(5) Link: “Arkansas Kundalini Yoga” … http://www.arkundalini.com/home/more-kundalini-yoga-information/breathe ..
(6) Link: “Discover the Ida and Pingala Nadis,” by James Bailey, 28 August 2007 … http://www.yogajournal.com/article/philosophy/balancing-act-2/ ..
(7) For more on the Autonomic Nervous System, see https://en.wikipedia.org/wiki/Autonomic_nervous_system#Sympathetic_division ..
(8) See … Link: “Somatic Nervous System” … https://en.wikipedia.org/wiki/Somatic_nervous_system ..
(9) Alternate Nostril Breathing … http://www.grdhealth.com/yogameditation/alternatenostril.php ..
(10) See … Link: “Breathing Practices and Pranayama in Yoga,” by Swamij … http://swamij.com/breath.htm#balancing ..
(11) See … Link: “Kundalini Awakening 2,” by Swamij … http://swamij.com/kundalini-awakening-2.htm .. This entry was posted in 06 – Monasic body / Higher mind body (Cosmic mind), A - My Favorites, Acting out - ahimsa - nonviolence, Alpha Centauri, Anger - rage - violence - hatred, Anxiety - fear - panic attacks - fight or flight - cognitive dissonance - mental turmoil, Ascension resources (referrals by Alice), Ascension symptoms, Enlightenment - satori - awakening - illumination - rapture - self-realization, Higher Mental Body, Incoming light - grace - leveling up, Lower Mental Body - gut brain (see also 'desire elementals' and 'lower triangle' and 'vital body'), Mastery of mind - subconscious - unconscious mind, Mudras and kriyas, Physical body and subtle bodies, Prayers - blessings - mantras - affirmations - white magic, Solar events - geostorms, Unconscious thought cloud of the world - noosphere, Unity - oneness - harmony, Yoga, ZZ- Awakening with Planet Earth and tagged acting out, aggression, Alpha Centauri, alternate nostril breathing, ANS, anxiety, autonomic nervous system, Chakras, collective unconscious, cosmic mind, enlightenment, fear, fight or flight, freeze and dissociate, Higher Mental Body, ida, incoming light, left brain, left-nostril breathing, long deep breathing, lower mental body, mastering the mind, parasympathetic nervous system, photon belt, pingala, right brain, right-nostril breathing, Soham Mantra, subtle bodies, Summer Solstice 2016, sympathetic nervous system, unconscious mind, unconscious thought cloud of the world, unity, Universal Mind, whole brain thinking, Yoga on 17 June 2016 by Alice B. Clagett.